Sadly, Dulciana passed away at 2:35 this morning. Our plan had always been to have Dulciana spayed before she was adopted into her forever home. Not only does spaying eliminate the chance of uterine cancer - very likely in non-spayed bunnies - but it can help with other health and behavior issues, in addition to eliminating pregnancy. While the procedure is common, it is not without its risks...especially in a medically compromised bunny like Dulci. But as she recovered from her head tilt and grew stronger and stronger over the months, we wanted to have the procedure done. Dr. Rebecca Arntz at VCA Bay Area Animal Hospital in Oakland had been Dulciana's vet ever since she came into our system. She is very bunny experienced, and would perform the surgery when the time was right. We waited for five months after Dulci had stabilized, then set the surgery date for Thursday, March 26th. The procedure went well; so well, in fact, that Dulci was able to return to her foster home that evening. She returned to VCA the next day so Dr. Arntz could recheck her, then went home again. Later that evening, she rejected all offers of food, and drank copious amounts of water. Although there were no obvious signs of pain or distress, it was clear that something was wrong. She was given Metacam (for relief of any pain), but by midnight it was clear that we were losing her. VCA is not a 24-hour facility, and her foster dad made the decision not to drive her to Pets Emergency Treatment Service in Berkeley because of her fragile state and the added stress the car ride would've caused. She and her foster dad settled in, and she died peacefully in his arms. Dr. Arntz performed a necropsy later that day. Nothing obvious was detected. All organs appeared normal and there were no problems with the surgery site or incision. Dr. Arntz feels that the anesthesia - which was correctly administered and monitored - probably placed too much strain on whatever had been causing her head tilt last year; she had titered positive for Pasteurella. Dulci will be cremated and her urn returned to her foster home. This sad turn of events is what breaks the hearts of those of use who rescue and rehab "Special Needs" bunnies. For all the joy we receive from our successes, we are devastated when the journey takes a turn such as this. But we tried our best for Dulciana, just as we do for the others that need our help. Dulciana had been doing so well. In fact, the day before her spay, Amanda (who was going to provide Dulci with her forever home as soon as she recovered from being spayed) spent the afternoon visiting her. It was a glorious spring afternoon and the two of them played outside for hours. And so, another sweet little soul has left us. Just before her spirit left her body, Dulci laid her chin down upon her front feet, closed her eyes, and drifted away. Her head was not tilted one bit, and now she can run and play freely again. Dulciana's veterinary care was made possible through the generous donations of caring and compassionate individuals. She did well through surgery, but likely died due to complications. WE are extremely grateful to the caring staff at VCA---Dr. Rebecca Arntz and Dr. Margaret Holliday for the tender care they gave Dulciana. Dulciana continues to do well with her rehabilitation. As you can see from these new photos her head tilt has almost completely corrected. She's given a lot of supervised playtime in the grass to allow her muscles to work and gain her hopping skills. She's able to move about without falling over. We're also working on litterbox retraining, and she's doing her best. The photos below were taken November 7, 2008 while Dulciana was suffering from torticollis, also known as head tilt or wry neck. Dulciana was found by an Animal Control Office lying in the gutter of a busy street in San Francisco in summer 2008. She exhibited symptoms of 'wry neck' and was rescued by Save A Bunny, then moved to a medical foster home in the East Bay so she could receive on-going veterinary care from Dr. Rebecca Arntz at VCA Bay Area in Oakland. Dulci (as her friends call her) has been diagnosed with Pasteurella, which has affected her equilibrium and balance, resulting in head tilt. At her worst during late summer, she would roll uncontrollably. Treatment first with Chloramphenicol then with Penicillin G helped greatly, and while she is still a little wobbly and sometimes loses her balance, she's able to right herself. Her head tilt has slowly corrected, going from about a 90 degree tilt in September to less than five degrees now. Her weight has increased from 2 1/2 pounds to just over five, and her physical appearance has vastly improved. Other than some herbs sprinkled on her vegetables, she's currently not on any medication. Several of the photos show her cage setup that allows her to roll freely without injury. A soft towel is placed on the floor of her Marchioro cage with rolled-up towels along the sides to act as 'bumpers'. All are changed as they become soiled. Half the cage was blocked off to restrict her space. Food and water bowls are placed in the cage several times daily, while timothy hay and vegetables are given 'free choice'. She has an excellent appetite. Now that her balance has improved and there's no more uncontrolled rolling, Dulciana is given a lot of supervised playtime outside her cage. She's able to hop around without falling, although she needs a stable surface. Thus, she's currently not able to use a litterbox, but maybe someday. Dulciana will continue to stay in her foster home and receive treatment from Dr. Arntz for the time being. Depending upon her progress, we hope to have her spayed in March or April. Then we'll see. Our goal is to be able to find a permanent home for Dulci, but it will likely need to be one that is experienced in caring for a bunny with slightly special needs. Are you that home? 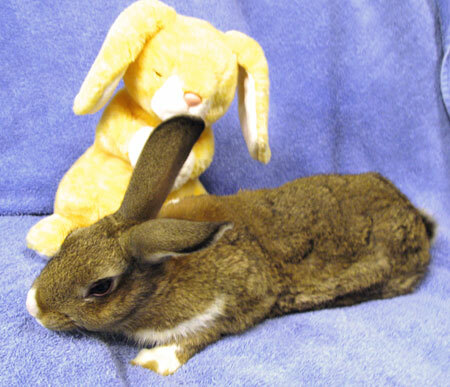 She's a wonderful bunny, sweet and affectionate, loves to snuggle, and gives lots of kisses. Save A Bunny is able to help rabbits like Dulciana receive veterinary care through the generosity of your donations. If you can help, please make a donation to our medical fund on her behalf.